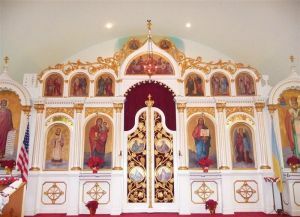 The history of the Ukrainian Orthodox Church Kiev Patriarchate of St. Nicholas in Cooper City, Florida. The years have passed by. . . Events have melted in the thick darkness of time. . . Names & Dates have been forgotten . . . and Sanctuaries have collapsed and been destroyed. . . But time will never erase from the earth the beautiful Orthodox St. Nicholas church in Cooper City, South Florida as long as at least one heart of Orthodox Ukrainian is beating – this church will live forever! As we know everything has its beginning and starts from a small idea. At our beginning, a small group of believers of the Ukrainian Orthodox Church, met at their first meeting on 15th of April, 1951. Since that date, expected results occurred. On May 31st of the same year, the Church was officially registered and the newly created parish had the first liturgy on July 15th. Inspired melodies, such as “Blessed is the kingdom” could be heard along the eastern shores of South Florida. Time flew by quickly and the efficiency of the first parishioners was astonishing. The land had been previously purchased in 1958. They erected a temporary church, which was blessed by Archbishop Mstislav on February 23, 1959. Parishioners had been working very hard. Soon the Charter of the church was prepared and approved. They organized the 8-year anniversary celebration and invited Metropolitan John Teodorovych. The Church Choir was organized. Although the parish consisted of only 12 families, the decision to build a new church on their own land was made at a special public meeting on March 19, 1967. 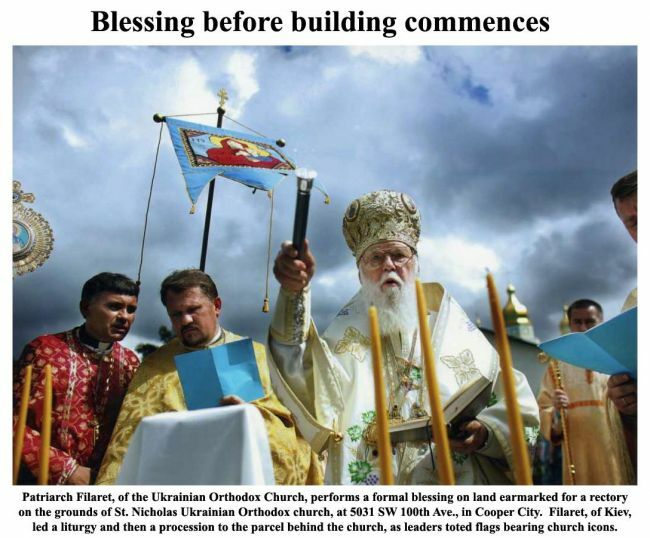 God was helping the parishioners, because a new Ukrainian Orthodox Church was completed in Miami in less than a year. It was consecrated by Metropolitan John Teodorovych in February 1968. The newly erected parish grew… in quantity and quality. This Church was attended by Florida tourists as well. Over time, most Ukrainians settled north of Miami. In 1988 the Parishioners decided to sell the church in Miami and relocate northward. With the money they received from the sale, a Building Fund was founded and they purchased 4 acres of land in Cooper City. The Ukrainian community accepted the sacrifice and the funds were obtained to build a new church. We can never forget December 1989 as our founders sacrificed everything to make this dream come true. The ground breaking ceremony took place and the “cornerstone” of brick from the Cathedral of St. Sophia of Kyiv was placed. With the blessing of his Holiness, Patriarch Mstislav and Archpriest Stephen Bilak the new church was erected. The memory of the event is stored in our archives for all parishioners and Ukrainians to share for generations to come. With the completion of the church, the Consecration Service was held on February 16, 1992. The Divine Service was performed by his Holiness, Patriarch Mstislav, with the newly appointed Clergy, Reverend Bilak. The new church opened its doors and welcomed all believers. Our Sanctified church became more magnificent after the summer of 1998. A well-known Iconographer of Ukraine, Mr. Ivan Balduha, painted the interior sanctuary with amazing icons. These unique icons are a treasure to all that enter our doors. All costs associated with the Iconography were a generous gift from well-known in Ukraine and U.S. promoters (patrons) —- Helen and Alex Woskob. Learn more about the St. Nicholas Church Iconography. In October 1998, St. Nicholas Church with joyful enthusiasm met His Holiness Patriarch Filaret of Kiev and All Rus-Ukraine. Since then Patriarch Filaret annually visits our Church (1998-2010). Our parish is growing and expanding. — In dreams parishioners have new plans. Last fall, October 30, 2010 His Holiness Patriarch Filaret of Kiev and all Rus-Ukraine blessed the hallowed ground for construction of a new priest’s residence. The local newspaper (the Sun-Sentinel) was present and published an article about the event. We welcome everyone to visit our Church of St. Nicholas so you can see how magnificent and beautiful it is! Standing at a depth of the road and as painted Easter Egg it glitters with its golden domes. The church is quiet, modest, yet majestic. When you are inside the church you can feel the presences of God. The melody of the choir fills your heart!